The caption in the ad suggests “stalker tool” is the appropriate label for this service. But wait: facebook ads are targeted. Facebook knows I’m single. 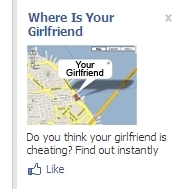 Facebook is always throwing ads my way to help me find a girlfriend. This one goes one step further: it shows me her location on a google map. Matchmaking made easy.